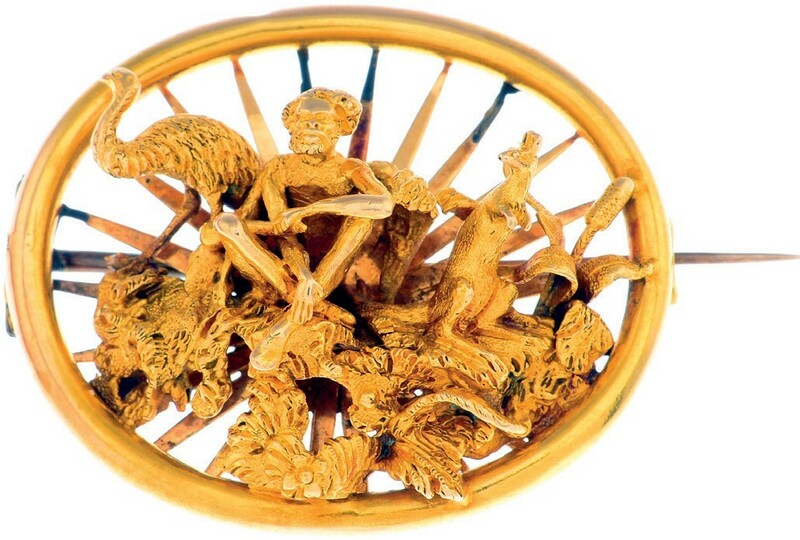 Among a selection of Australian gold rush era jewellery from c.1860 sold in the UK in the last few months, this brooch in the manner of Hogarth, Erichsen & Co took £7300 at Fellows. The distinctive Antipodean jewellery of the gold rush era is among the first to depict the native flora and fauna of the continent. It is of huge cultural significance to Australia and its mining heritage. Pieces of ‘botanical’ jewellery can be found in the Powerhouse Museum, Sydney; the National Gallery of Victoria, Melbourne; the Queensland Art Gallery, Brisbane; and the National Library of Australia, Canberra. One and half centuries of economic and social history ensures pieces also occasionally appear for sale in the UK. By coincidence several have been sold in recent months. The Sydney firm of Hogarth, Erichsen & Co pioneered the style. Julius Hogarth, a die-sinker and silversmith born in Copenhagen, reached Sydney in the César Godeffroy in December 1852. Conrad Erichsen, a Norwegian engraver, was another passenger on the ship. The pair were awarded a bronze medal at the 1854 Sydney colonial exhibition for a brooch decorated in intricate three-dimensional detail with an Aboriginal figure, an emu and a kangaroo – the earliest-known piece of this type. Few pieces with a definitive connection to Hogarth, Erichsen & Co are known (only a handful are marked or come in original boxes). The brooch offered by Fellows (23% buyer’s premium) on January 24 was of sufficient quality to tempt bidders to make an attribution. Alex Duffy, Fellows jewellery specialist, described it as “a beautifully crafted example of Australian colonial jewellery”. The piece garnered a lot of interest before the sale and, against an estimate of £500- 700, hammered at £7300. It was bought by an Australian internet buyer using thesaleroom.com against two phones and bidders in the room. Many Australian jewellers emulated Hogarth and Erichsen’s work in the 1850s and ‘60s. A gold rush-era brooch c.1860 sold for an unpredicted £2800 at Truro auction house Lodge & Thomas (15% buyer’s premium) on September 28. 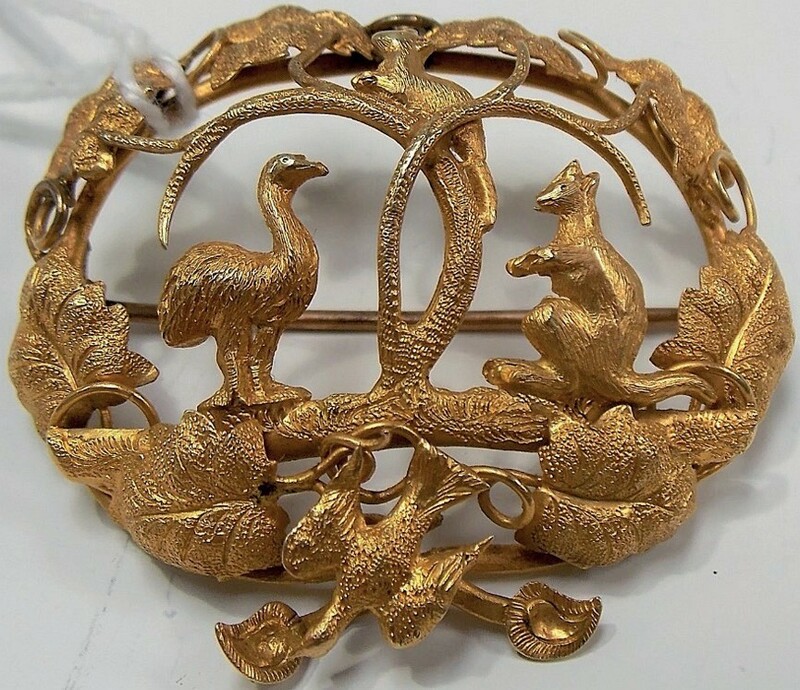 This brooch, depicting a typical display of a kangaroo, ostrich and possums, was not of the same quality but the buyer was again an internet bidder on thesaleroom.com paying a high multiple of the £100-150 estimate. 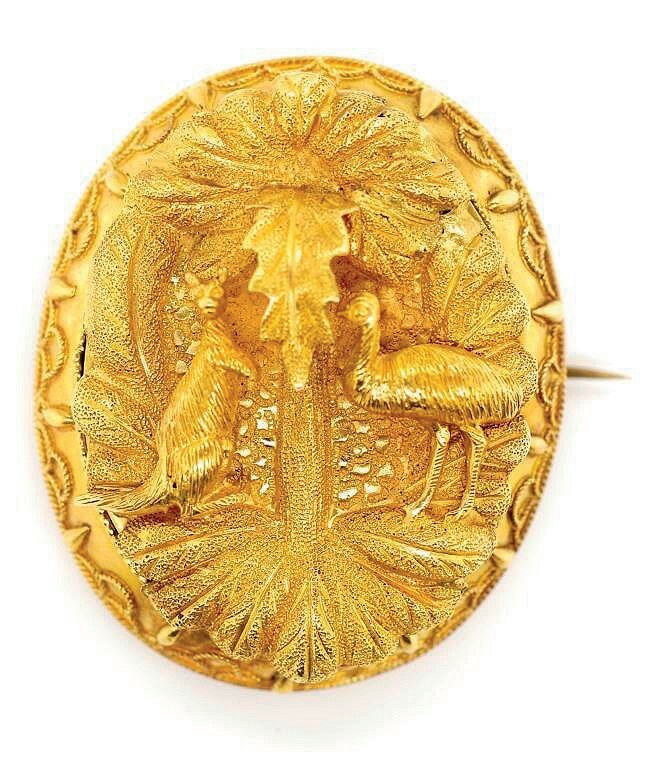 A gold emu, kangaroo and possum brooch – £2800 at Lodge & Thomas. 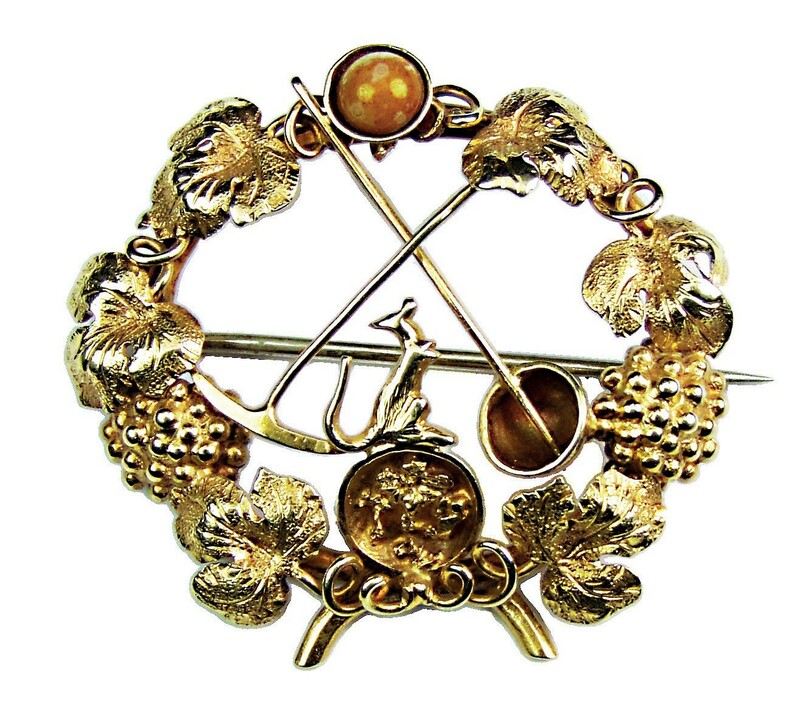 A variant on the theme is the gold prospector’s brooch, typically combining marsupials, palms and grasses with gold pans, shovels, pickaxes and gold nuggets. Similar pieces were created for sale in South Africa and California in the wake of 1849 and all that. The final sale held at George Kidner in Lymington on January 10 (the auction house has now closed) included a typical example. Comprising a kangaroo standing on a panel of gold nuggets within a grapevine border, it was stamped to the reverse WL between symbols of a bird and a crown. This brooch sold for £2000. A gold and gemstone prospector’s brooch – £2000 at George Kidner. Completing a sweep of prices for Australian gold rush jewellery, back in 2016 Chorley’s of Prinknash Abbey Park offered three pieces that came by direct descent from Hugh Hamilton (1822-1900), a New South Wales cattle rancher turned gold commissioner. A brooch, in a fitted case for Hogarth, Erichsen & Co, sold at £14,000 while an elaborate openwork bracelet bearing the mark of the goldsmith and topographical photographer Christian Ludwig Qwist (1818-77) took a mighty £57,000. A brooch by Hogarth, Erichsen & Co – £14,000 at Chorley’s in 2016. Qwist worked for Hogarth and Erichsen just before their 1861 bankruptcy, and it is likely that the oxidised silver figures of emu, kangaroo and Aborigine that populated the bracelet would have been supplied by Julius Hogarth c.1863-65. A locket/brooch – Aus$3400 (£1900) at Barsby Auctions, Sydney, October 20.